Bring a Book Baby Showers are a growing trend and with good reason. Reading is an important part of baby's development and having plenty of reading material on hand makes reading fun for both the baby and the parents. If you're planning a book themed baby shower or if you'd just like to include the "Bring a Book" idea into the traditional baby shower you're planning, you're going to love all ten of our featured storybook baby shower invitations. We've included, bring a book baby shower invites for both boys and girls as well as gender neutral invitations for the baby who remains incognito. Brought to you by Zazzle, these high quality shower invites all come with a white envelope and Zazzle's 100% satisfaction guarantee so you can browse happy. Low pricing is determined by your choice of card stock. 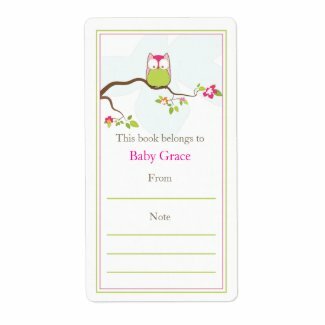 Click on your favorite designs to learn more or to see a larger image of these adorable book baby shower invitations. If you'd rather hold a more traditional baby shower with the "Bring a Book" idea included, you could insert one of these special cards into each shower invitation. The book could be given instead of a greeting card or you can purchase (or make) a special book shelf (or get some cute bookends) and request books instead of baby items for a clever wishing well. However you decide to do it, "Bring a Book" is an awesome way to build baby's library and help instill a love of reading at a very young age. Custom Personalized Bookplate Stickers make baby's book collection even more special. Provide one sticker for every guest to use. Write on them with permanent markers. If you're looking for ideas for a book to bring to a Bring-a-Book baby shower, visit my Bring a Book Baby Shower Books, where you'll find a listing of unique ideas and recommended reading books for baby, new moms, new fathers and even the new grandparents. There's plenty more to see! Share your best "Bring a Book" Baby Shower ideas with us in the comments section.